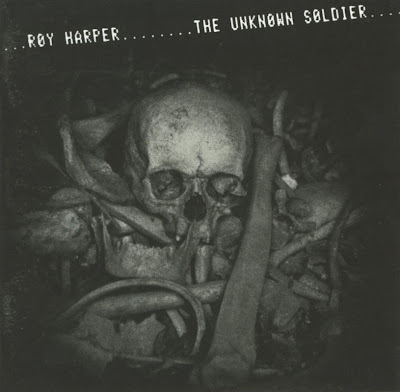 Whilst duets are not commonplace on Roy Harper albums, Kate Bush accompanies Harper on the song "You" to great effect. The song "Short and Sweet" features David Gilmour on guitar and is also found on Gilmour's first solo album, David Gilmour. In fact, Gilmour plays guitar on most of the songs and co-wrote five of the album's ten songs, Harper providing the lyrics and Gilmour the music. Originally, the songs "I'm In Love With You", "Ten Years Ago" and "The Flycatcher", were to be released on an earlier (1977) Harper album, Commercial Breaks. However, a dispute between Harper and EMI meant Commercial Breaks was not released until 1994. These three songs were re-recorded for The Unknown Soldier, and vary slightly from their original composition.
" Perhaps the most remarkable moment in...the making of this record was the trip... to the battlefield at Verdun in France to take the pictures for the sleeve...disembarking at Boulogne in an undrivable hired Rover with an arse-end three miles in the air and a steering wheel on the wrong side. We hurtled down France for half a day...at the end of which we walked, stoned and soaked, into a Pension and I asked for a room for the night in my schoolboy French. "Avez vous une chambre ce soir.... etc." And a lizard woman looked us up and down... What we saw the following day brought me to tears... A sea of graves, surmounted by a monument the like of which I'd never seen anywhere. In style, it is pure Art Deco, in deference it is Egyptian, and in effect it is devastating. And it is full of the bones of hundreds of thousands of men; visible through the windows of the basement around the building. We took the pictures, even though it seemed like a sacrilege. And isn't that the nature of our beast..? I can't remember the journey home, except for its silence. Roy Harper.